The boundary of Sutton follows the south bank of the E brook to a point about 300 yards south of Penns Lane, where it heads off in a westerly direction along an old watercourse. This old watercourse or ditch runs along the south side of a playing field, along the south side of the grounds of Penns School, and the boundary continues along the south side of Harman Road. The old watercourse is indistinguishable now, but the boundary is very old, and it was probably more of a feature over a thousand years ago when the Anglo-Saxons were marking out their territories. In 1824 Mr. Harris, the Commissioner for the Enclosure of the Commons of Sutton Coldfield, surveyed the Sutton boundary, and this section gave some trouble. He followed it across a meadow “then up and through the eastern fence of another meadow near an alder tree” and across that meadow “to a very large stone in the eastern fence of a meadow belonging to James Hipkins” and then to another stone before reaching Orphanage Road (then called Bell Lane). Is there still a big stone somewhere near the Elphinstone End entrance to Penns School? These meadows to the south of Penns lane belonged to farms on the Erdington side of the boundary, Little Pitts Farm and Berwood Farm, and contained several ponds which had been formed where marl had been quarried - it was used to spread on the land to improve fertility. It was in one of these ponds that the body of Mary Ashford was found in 1817. She had been walking home in the early hours with her lover Abraham Thornton; Thornton was accused of her murder, but as the cause of death was drowning it seems more likely that she decided to bathe in the pond and lost her footing. The pond was beside a well-trodden field path, and her body was soon discovered by a man on his way to work at nearby Penns Mill. Mr. Harris’s account of the bounds of Sutton ends “to the Birmingham and Lichfield turnpike road thence across the said road to the junction of the boundary where this perambulation began”. He had travelled twenty-six miles since starting his perambulation. The Perambulation was dated 5th October 1824, part of the process of enclosing the commons; also in 1824 a detailed plan of Sutton showing every field and every house was being compiled for Mr. Harris by two local surveyors, Henry Jacob and William Fowler. Each field had a name, for example field 1997 was “Hilly Piece”, but field 1990 had a new name - “Mary Ashfords Piece”. In 1817 the field path used by Mary Ashford ran along field 2000, but the 1824 map shows a “new footroad set out” across field 1999, linking Orphanage Road and Penns Lane. 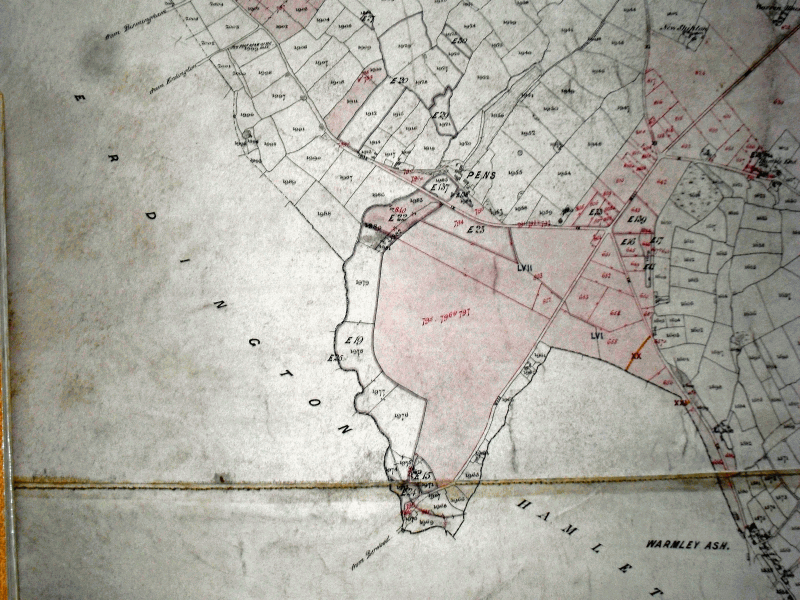 Part of the Corn Rent Map of Sutton surveyed by Jacob and Fowler in 1824; Penns Lane runs diagonally across, Orphanage Road terminated at Penns Lane.